Well depending on where you are reading this, summer time means heading off somewhere on vacation, or at worst, a long weekend away somewhere. This year my wife and I are choosing the latter, and in September will head out of town for a few days. So perhaps because of that (and also because I have not been taking so many monochrome photos recently) my mind goes back to previous vacations, such as last year when we went to one of our favorite places-Cape Cod. One of our favorite parts of being there is the area that comprises the Cape Cod National Seashore, which is a part of the National Parks system. There is a trail there that winds through the Nauset Marsh, a unique little ecosystem fed by the ocean and seemingly held together by the grasses that line the entire trail. At one point it meanders past this timeless scene (which I have used a color version of in an older post). The trees in the distance and the old shed are unmarred by any sort of technology. There are no power lines or even a garbage can anywhere in view in this photo. And that is why every trip to Cape Cod I ever take, I always make sure I stop by this trail. Honestly, if I had to pick just a handful of places where I could happily sit and watch the world go by, this would easily be one of my favorites! Reflection. It is one of the most exciting and frustrating aspects to photography. It is difficult to get the balance just right. To have the camera positioned so one half of a photo is ‘above’ while the other half is ‘below’. It is also hard to get the clarity of the reflection just right. But when it is done right, the results can be very satisfying. I remember taking this shot last year in Cape Cod. I took the same shot in color and monochrome, but when I viewed them both, the monochrome shot had that little bit of ‘magic’ for me. Something about the reflection in this case seemed much more pleasing. Let me know what you think in the comments, and do make sure to follow me on social media. Links to the right or below the photo. Until next week! As a general rule, when I want to ‘go’ somewhere I prefer to go to a place near water of some sorts. That might be the ocean, or a lake or river. Being near water just makes me happier I guess. Occasionally though I might find myself on a hiking trail in the woods, marveling at the strength and resilience it represents. Old trees and young saplings. The conversations among different species of birds. Dense undergrowth of grass and wildflowers. There is a real sense of life in the woods-both the seen and the unseen. Strangely enough though, I took this shot last fall in the woods….right next to the ocean as it happens. Cape Cod is a nature lover’s paradise. Though most people rightly associate it with being on the ocean or the bay, there are also dense areas of woodland. 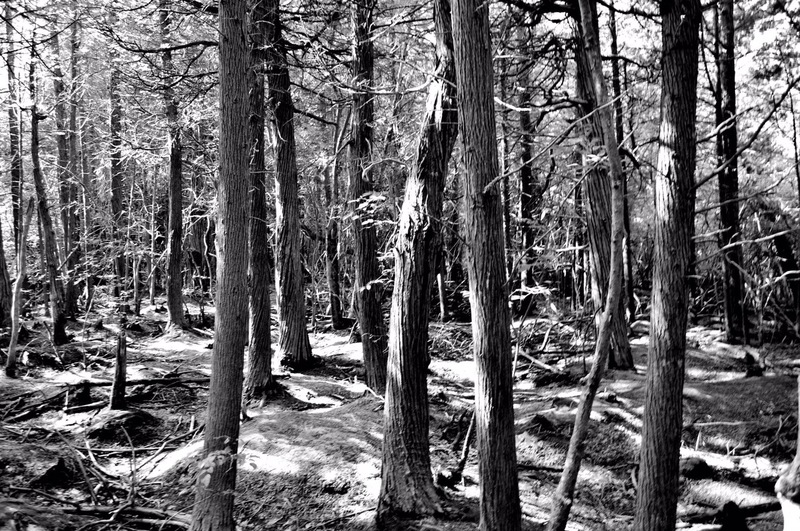 This photo was taken on the Atlantic Cedar Swamp Trail, within the Cape Cod National Seashore, mere steps away from the relentless Atlantic Ocean. A perfect place to go when you like being near the water…or the woods! For me one aspect I particularly love about photography is the fact it can make its subject timeless. It freezes the object of the photograph in place, forever preserving it in time. Locked in place as it was the day the photo was taken. Sometimes though, the subject matter is itself timeless and my action of taking a photo becomes a way for me to prove the scene has remained unchanged over time for myself. Such was the case with last weeks photo in Monochrome Mondays of one of my favorite spots in Ireland. Similarly, a fabulously rickety old bridge in Wellfleet, Massachusetts known as Uncle Tim’s Bridge has stood unchanged since my first encounter with it over 20 years ago. Long may more things stay that way in this chaotic world! I can’t believe we are approaching the end of the year already! Just like last year I decided once again to feature some of my favorite photographs I have taken this year. Trips to Ireland and Cape Cod provided lots of good photo opportunities, as well as continuing to explore more of my neighborhood in Queens, New York. The rest were taken on various excursions all over the place. All together some have appeared in earlier posts, while others are making their debut here. I hope you enjoy my choices. Let me know in the comments what your favorites are! Remember, I have also recently added a new feature here called Monochrome Mondays so be sure to stop by every Monday for a new photo every week. Click on any photo below to have them open up to a larger size.